This post was sponsored by Stonyfield and Tommee Tippee. I was provided with free products to sample. As always, all opinions expressed are my own. As a parent of a toddler, I know how challenging mealtime can be. Especially on busy weekdays when there never seems to be enough time in the day to get everything done. So I appreciate the little things. A sippy cup that doesn’t leak. Bowls and plates that stay put and can’t be flung across the room. A reliable dish or recipe that I know my daughter Sienna will eat without a struggle. Basically, anything that can make feeding her a little bit easier is a plus in my book. 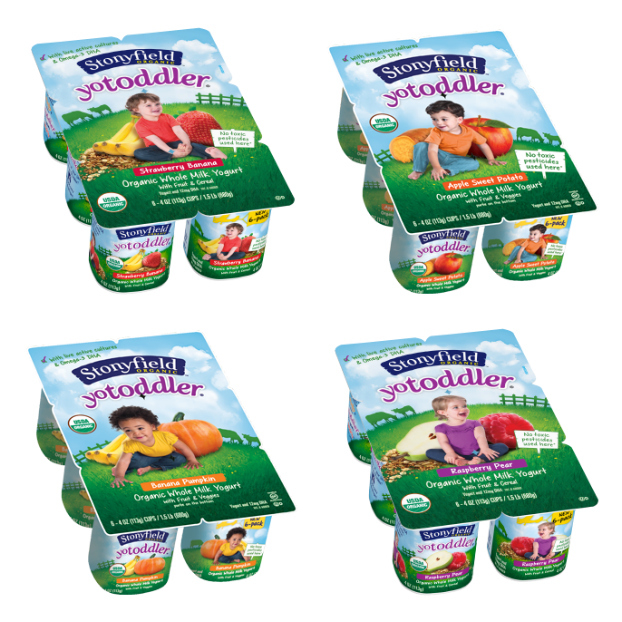 So when I found out that Stonyfield had paired up with Tommee Tippee to help our little ones enjoy their YoToddler organic yogurt using Tommee Tippee feeding products, I jumped at the chance to try them out. My daughter has grown up eating Stonyfield products. Fortunately, even through her picky phases, she’s always loved yogurt. Stonyfield uses only the highest quality, organic ingredients, all sourced from family farmers they trust. She’s now moved on to YoToddler- Stonyfield’s line of organic whole milk yogurt made for toddlers that have added omega-3 DHA, which is crucial for the development of your baby’s brain, eyes and nervous system. With unique flavor combinations like Apple & Sweet Potato and Raspberry Pear, YoToddler makes eating fruits & veggies even yummier. Stay tuned to find out how you can win coupons for two free YoToddler six-packs! Tommee Tippee is a company that makes a wide variety of products for infant and toddler feeding, infant soothing and diapering. The folks over at Tommee Tippee sent over a fantastic assortment of feeding products for us to try out including an Easy scoop feeding bowl, an Easi-mat, Easi-roll bibs, spoons, and insulated sipper tumblers. The products we received were very bright and colorful- Sienna couldn’t wait to open everything when the package arrived. And if that wasn’t enough, Tommee Tippee is providing another set of these products (in gender-neutral colors) for me to giveaway to one of my lucky readers! See below for details on how to enter. Leave a comment below for a chance to win all of these products (in gender-neutral colors)! that it catches food better than most traditional bibs. They’re also easy to clean and roll up nicely for storage and travel. 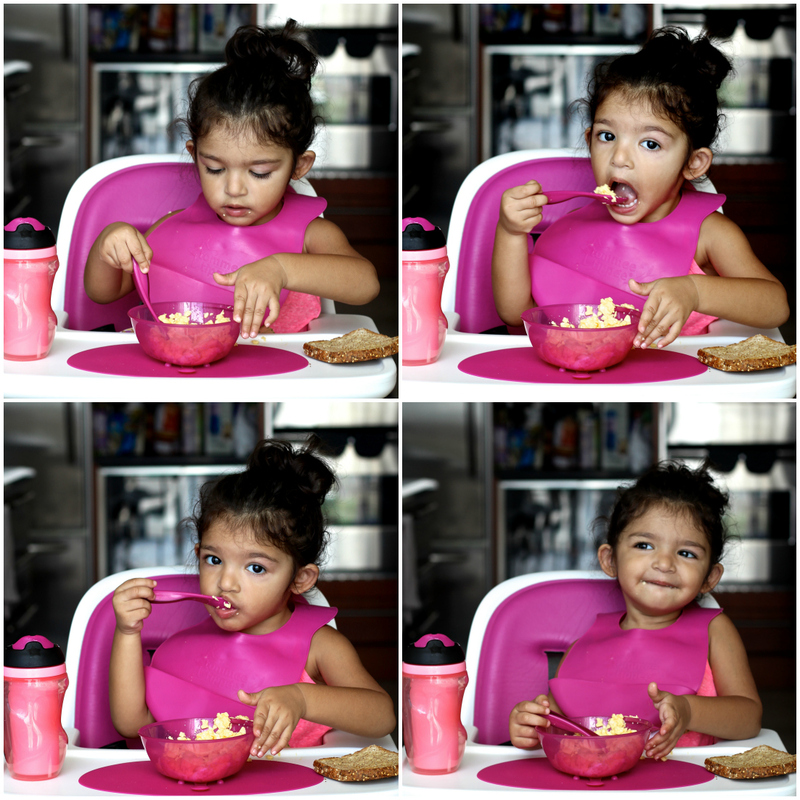 Sienna enjoying all of her pretty pink Tommee Tippee products! on the market. Sippy cups, straw cups, cup with handles, cups with no handles, you name it. My kitchen cabinet is filled with tons of cups, all of which promised some special feature. After trying the Tommee Tippee insulated sipper tumbler, I can actually say that I found a cup that doesn’t leak. Even when my daughter turns the cup upside down and shakes it like she loves to do! In addition, it keeps her cold drinks cold for a long time and has a nice soft spout, which is gentle on her gums and teeth. It’s lightweight and perfect to take on the go, keeping her hydrated all day. Another great feature is that if your child prefers it, you can add on handles from other cups in the Tommee Tippee line as they’re all interchangeable. You can also remove the non-spill valve when your little one is ready to practice free flow drinking.GIVEAWAY TIME! To enter to win Tommee Tippee products (an Easy scoop feeding bowl, an Easi-mat, Easi-roll bibs, spoons, and insulated sipper tumblers) and Stonyfield coupons for two free YoToddler six-packs all you have to do is leave a comment below. Not sure what to write? Anything goes, but feel free to answer one of these questions. What’s your best tip for feeding toddlers? What’s your child’s favorite snack? What’s your favorite yogurt flavor? I’m looking forward to hearing from you. Good luck!The contest ends on Sunday June 7th at 11:59pm EST. One entry per person. Giveaway open to U.S. residents only (sorry to all my international friends). I’ll update this post with the winner’s name on Monday June 8th so make sure to check back in then! I've never tried any Tommee Tippee products, but they all look really neat! I would love to try these products for my very messy toddler! I love that the bibs folds up, it would be perfect for keeping in the diaper bag on the go! These things will be great for when my grandkids arrive. First off, Sienna is a doll! If only my hair looked that great most days without trying! Second, I love YoToddler products. My boys are big fans too! Those bibs are ideal for messy toddlers… which is every toddler, am I right?! Hahaha, I'm with you on the hair, Katie! This would be so much fun to share with my sweet little grandson. My tip for feeding toddlers is make food fun – and have plenty of variety. I have two toddlers, and I find that when I'm excited about food – they are excited too. I've raised them to love veggies and fruit. Thank you for the wonderful giveaway. That mat is genius! Thanks for hosting the giveaway! My kids and I love strawberry yogurt. Thanks! My daughter would love the tumbler. Great giveaway! I wish I had had an Easi mat when my daughter was younger – oh the wasted food! Btw, my daughter and I have constant tussels over who gets the last container of Stonyfield Petite Creme! Hope you have a wonderful weekend! What a cutie! And looks like those Tommee Tippee items make it easier for her to be independent at mealtime, which is always great! Sienna is just adorable! And love the then and now pics in the high chair! We're past the stage of all these items now, but wish I had known about them. Never heard of Tommee Tippee before! We like blueberry yogurt in our house! They're apt to at least try anything you eat and say, "Mmmmm" even if they've turned it down before. My 17 month old grandson refused the (gloppy, eww, sorry) sweet potato casserole, but when grandma baked a plain sweet potato he HAD to eat it by the handful. Frozen peas are also a great idea. Overheard at a baby shower from a new dad to the expectant parents, "Forget those cute mats around the high chair. What you need is a large tarp which can be taken outside and hosed off." Hilarious. As they grow and eat tomato-based sauces, puree all sorts of veg: zucchini, eggplant, legumes, greens in a good blender and add. My kids used to say they didn't do green food. Years later I confessed the pizza/spaghetti sauce, chili, and stews were at least as much veg as meat. Budget tip: save all the veg ends bagged in the freezer and use for homemade chicken stock from a carcass. We eat our snacks together, she loves that! We like to get the strawberry yogurt and add granola or get vanilla yogurt and add berries and granola! Thank you for the giveaway event. Your site is fantastic! I'm a new follower. I agree with Erin's fun tip for feeding toddlers. I sometimes act a little silly (funny faces/sounds) to make my toddler laugh. It makes feeding time a bit more fun. We enjoy all kinds of yogurt! I love strawberry or blueberry yogurt. My kids love apples and peanut butter.